The F111 is a truly special aircraft and the story of how it came to be is a fascinating and wonderful lesson of mixing dreams, ego, politics, engineering, and in some cases tragedy. Like many things in history, the F-111 project came into existence because of several threads and the appointment of particular people at particular times. The Cold War was at its height with the US starting to deploy its B-52 long range bomber, and the B-70 Valkyrie high-altitude supersonic bomber under development. At the same time, the US Navy was starting to look at a replacement for the F-4 Phantom fleet defence fighter. Such an aircraft would need endurance, missiles, two crew, the need to operate off Carriers (obviously) combined with speed and agility. Then it all changed. 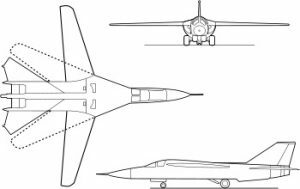 In 1960, the Soviets shot down a U-2 high-altitude reconnaissance aircraft with a previously unknown missile (the SA-2). It became obvious that the B-70 was obsolete before it had even begun production and as a result, the requirement for a replacement of the F-105 Thunderchief was issued – that of a fast, long range, low-level intruder able to operate from relatively basic airfields. A new, dynamic President came into office. His choice of Defense Secretary, Robert McNamara had no operational Military experience – whilst he did serve in a valuable post in WWII, leaving the USAAF with the rank of Lieutenant Colonel, he mainly oversaw statistical analysis of operations. He was a businessman, having helped re-build the Ford Motor company after WWII and was President of Ford at that time. McNamara and his new team in the Defense Department became known as “Whiz Kids” who approached the Military experience from the viewpoint of mathematics and business practice. Whilst this had benefits, it downplayed hard-won military knowledge and ultimately resulted in some unpleasant lessons for the US Military in combat. One of the first acts of the new Defense Secretary was to direct the USAF and US Navy to combine their requirements for this new aircraft and to develop a common machine for both services. Whilst the two services were resistant, they were forced to embrace the TFX programme. Before the end of 1962, General Dynamics (now part of Boeing) had been selected as the winner of the competition to build the F-111. The F-111 design introduced several significant technology advances, The most obvious is that of the “swing-wing”, which until NASA came up with a practical design, was simply not going to work. Whilst it did work in this implementation, as an aircraft feature it did not catch on. The engines were a major step forward, introducing both a Turbofan engine for fuel economy, and a variable afterburner. An escape capsule, whereby the entire cockpit section of the aircraft separated from the air-frame was incorporated to improve crew survival at the high speeds envisioned for possible ejection. The ability of the aircraft to automatically fly at Mach 1.2 (about 860 miles per hour or 1400 km/hr) at 200 ft at night in bad weather was an amazing achievement. Australia ordered 24 machines in October 1963, and was expected to take delivery in 1968, with operational readiness a year later. The collective memory in Australia of this order is that it was one of those election “rabbits” that politicians are so keen on. This was not the case, since the decision had been a long time coming. Studies to find a Canberra replacement had been conducted since the mid ’50s, with a recommendation then of one of the British “V-Bomber” types. In early 1963, a further study looked at several contenders including the A-5 Vigilante, the F-4 Phantom and the TFX, from which the TFX emerged as the recommendation. Still nothing was done. Then, Indonesia’s growing belligerence became of increasing concern, and it was claimed they had Soviet TU-16 bombers that could strike Sydney, with Australia having no retaliatory capability. Neither, at the time, did Australia possess any intercept capability for any high-flying intruders, and it was claimed that Indonesian aircraft had flown as far as Alice Springs on tasks (This resulted in the Mirage III purchase). At the time, a unit of British Bloodhound missiles was stationed in Darwin as a rapid response measure. Finally, during the 1963 election campaign, and in response to the Labor Party’s stated intent of replacing the Canberra as soon as possible, Menzies announced an order for the F-111. Right from the start, it became apparent the extent of the engineering challenges ahead. The escape capsule alone required enormous engineering effort and the cost and weight of the project increased. There were many times that the requirements of the Air Force and Navy clashed and those of the Air Force prevailed, causing the Navy to become less enthusiastic about the project. Whilst the aircraft was effectively a missile carrier for the Navy, it was still expected to be able to hold its own in any combat, and with the increasing weight, this became less and less likely. An initial deployment of the aircraft to Vietnam in 1967 finished with mixed results. At that time, the machine was used as a delivery mechanism for “dumb” bombs, so had to fly over the target to release the ordnance. It was found that the emissions from the Terrain Following Radar could be used to detect an oncoming aircraft, and a network of spotters could be used to time the arrival of an aircraft at a specific location and then engage it with AAA. Whilst not perfect by any means, this AAA technique was successfully used. There were some mechanical losses, including three for unexplained reasons, and some failures of the Wing Carry-through boxes were detected and this required re-design. The mid-sixties was when Colonel John Boyd, a rather loud, irritating, but brilliant USAF pilot made a presentation to some senior Pentagon personnel. Before continuing, some background is probably in order. Colonel Boyd developed the theories of air combat that most Air Forces the world over currently use. The US Marines adopted his theories as the basis of their combat philosophy and he was the author the Battle Plan that enabled General Schwarzkopf to defeat the Iraqi forces in the First Gulf War. He was the first person to approach air combat and aircraft energy capability using mathematical analysis. At this presentation, Boyd demonstrated to a shocked audience the inferiority of current and projected US fighter aircraft. The F-111 in its air-to-air role came in for particular criticism. Not long after this, the US Navy cancelled the F-111B and started development of the F-14. Similarly, the USAF approached development of the F-15 somewhat differently than their initial intention (with significant input from Boyd). As an aside, Boyd was never happy with the F-15 and considered it “Gold Plating”. He ended up being a champion of the F-16 with considerable design input to that as well. 1968, and the F-111Cs were delivered in the USA, but not accepted by the RAAF. It took five years before the machines arrived at Amberley, with problems related to the wing attach points and the engine intakes needing attention to the satisfaction of the Australian representatives. During all this, the controversy in Australia raged. If you think the snipes about the F-35 are something .. well .. the F-111 was a major attack subject at the time. Everyone, it seems, had an expert opinion on the subject. “4 Corners” had a major episode about it, knifing the “111” and extolling the F-4. Remember – no Internet or instant communications then – just newspapers and Black and White television. And there, hidden in the corner was a little voice, slowly gaining traction pointing out that the F-111 was now the safest jet “fighter” the USAF had acquired, with an excellent safety record. Of course, the RAAF eventually did get 24 F-4E machines to fly until the F-111 arrived. One was lost when they dived into the sea at night, and another was severely damaged in a landing accident. That second one provided some problems when the time came to return the aircraft – seems the US agency concerned had written the machine off and were perplexed to see it in the number to be returned. Finally, in 1973 the F-111C arrived. The F-111 was a great strategic strike aircraft. It was originally thought of with “dumb” bombs but quickly acquired “Pave Tack” that allowed it to fly toward a target and at about 10 miles, release a glide bomb. At the same time it would turn hard and whilst a television camera in the nose of the bomb relayed targeting images to the aircraft. Additionally a laser could designate the target allowing a precision strike and allowing the aircraft to stay well clear of danger. Further advances reduced its vulnerability even more. Even now, with its ‘searchlight’ radar emissions, it would be able to fly long distances by itself and strike the designated target. This low-flying capability is best used at night and using terrain masking. The RAF found out the hard way in Iraq that flying low and fast in open country still gets you shot down. The F-111 was fast, very fast. There are stories from Mirage pilots, of finding an F-111 during exercises and locking it up on their AI radar, only to see the range to the target increasing as the F-111 quickly accelerated away using its vastly superior low-level speed. Time was what really caught the F-111. The RAAF had been the only operator of the type after the USAF retired the last of their fleet in 1998, and the construction techniques used were simply not meant to last for five decades. Whilst the engineering expense needed to keep the machines in such good condition got greater, there was still the problem of such exotic materials being poisonous and carcinogenic. Should operational deployment be necessary then the RAAF machines would be on their own, being less and less able to operate with their partners as later aircraft made greater use of “swarm” type communications to talk to each other. Whilst it is one thing to know you still have a magnificent asset, it is another to have to be realistic and see that it is eating a huge portion of your defence allocation far in excess of what is wise. The F-111 is still a potent system, however in an age when Tomahawks can fly though windows, what other capabilities would we have been willing to sacrifice to keep it in the air? In USAF service, the F-111 was known as the Aardvark, from its long nose. The RAAF called it “The Pig” – a wild, mean, bush boar. It seems to have come as a shock to many that the Government has so actively destroyed the former F-111 fleet. 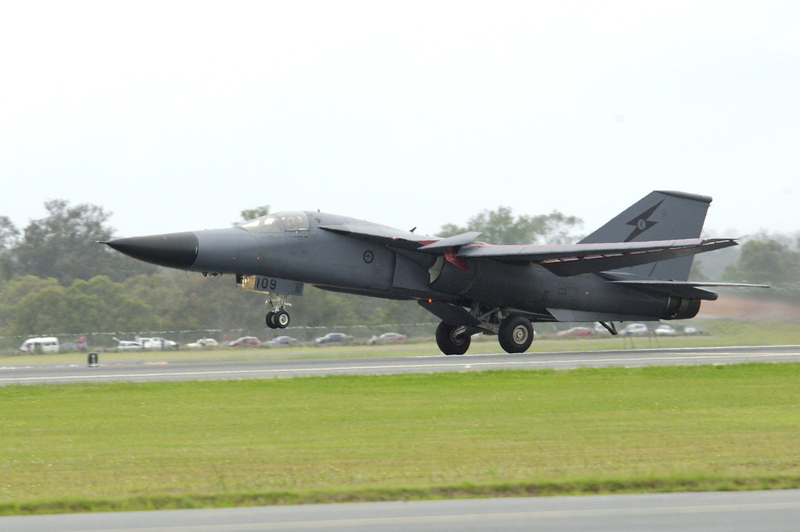 For example, of the F-111G force we had, there is only one remaining at Pt Cook – the remainder have been destroyed. Well a little thought would reveal the obvious answer. Salt. No, not NaCl, but S.A.L.T. The F-111G was, in a former life, the FB-111A – a nuclear strategic strike bomber designed to attack the Soviet Union. Once it was retired, it was still capable of being re-activated so under the treaty the obligation was to destroy it. As for the remainder of the F-111 fleet, the attitude of the US Government to their military aircraft exports has hardened considerably over the last decade. They would be particularly sensitive to a fleet of F-111 strike aircraft just sitting around with the capability to be re-activated outside their control. We at HARS are extremely fortunate to have the opportunity to display this aircraft even under the conditions imposed. F-111 A8-109 started life as an F-111A, built in 1967 for the USAF (Serial # 67-0109) and served in Vietnam where it notably flew “Linebacker” missions toward the end of the Vietnam war. Eventually it was bought by the RAAF as an “attrition replacement” in 1982 and re-built as an F-111C. When the F-111 was retired in December 2010, this particular aircraft was not scheduled to fly on that final day, but was the “reserve” display aircraft. A8-134 “broke” so five minutes after the rest had departed, A8-109 became the last F-111 to takeoff … ever. The honour of the last to land went to A8-125, the first F-111C to land on the delivery to the RAAF in 1973, however A8-109 was the last to share the sounds of a live F-111 with the World when at ~1.42PM on 3rd December, 2010 the crew of FLTLT McGrath / FLTLT Romanowski shut down the engines and all became silent. Finally, to add to the special nature of this particular aircraft, it was revealed during the presentation ceremony that A8-109 is the “highest time” F-111 in the former RAAF fleet, and quite possibly the entire fleet. A truly special aircraft.